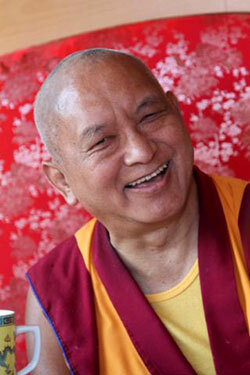 Lama Zopa Rinpoche, Washington, United States, July 2012. New Online Meditation Program – Vajrapani Institute Needs to Hear from You! Lama Zopa Rinpoche and Ven. 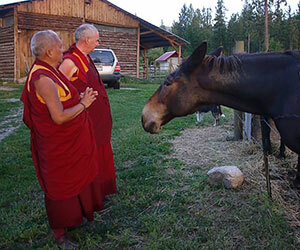 Roger Kunsang saying mantras for horses, Washington, United States, July 2012. Photo by Ven. Holly Ansett. Rinpoche is in good health and progressing well. For updates on Rinpoche’s health, go to Rinpoche’s Health – Updates and Practices for photos, more information and to subscribe to our RSS feed for updates. “Thank you very much. Can you imagine how urgent it is to have a Dharma learning center? If you think of the world situation and how much suffering there is – think of all the problems, famine, disease and torture; the demonstrations, killing and so forth; then all the new diseases that are coming, diseases the hospital cannot help; as well as tsunamis, the danger of fire, water, air and earthquakes. Sentient beings in the six realms, including oneself, have unbelievable suffering … there is so much suffering due to meeting undesirable objects and so much suffering due to not finding desirable objects. Much of our life goes into trying to find desirable objects, but even when we do find them, we can’t get satisfaction. On the other hand, those who are practicing Dharma and who renounce samsara by understanding the sufferings of samsara – the suffering of pain, the suffering of change and pervasive compounding suffering – even if they are living in a grass hut, just eating tsampa and water, or rice and dahl, have great satisfaction. They are very happy, so happy, more happy than the billionaires and zillionaires and trillionaires who are living their lives with the eight worldly dharmas and self-cherishing thought. Rinpoche recently wrote this foreword in English and Tibetan for a book being published only in Tibetan and Mongolian about Shugden (Dolgyal). 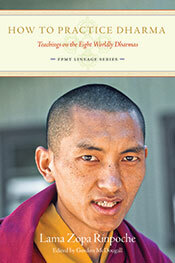 The book is a compilation of His Holiness the Dalai Lama’s teachings on Shugden given between 2000 and 2007. The foreword was meant to just be a few pages, but in the end became longer, and is an incredible teaching. We are delighted to announce that a revised version of The Initial Practices of Vajrayogini is now available at the FPMT Foundation Store in hard copy. This 2012 edition has been revised and reformatted with special attention to accuracy and a new user-friendly format for retreat and personal practice. With input from three different translators and FPMT’s complete editorial team, this is our finest edition yet and one that all practitioners of Vajrayogini will be happy to have on hand! Digital versions of the contents of this text will be available for download shortly. Prayer to the Six-Syllable Great Compassionate One is now available as an eBook. French versions of Amitayus Long Life Sutra are also available online. Several new resources, including updated pecha scans and two audio recordings of Lama Zopa Rinpoche, have been added to the Sutra for Entering the Great City of Vaishali advice section. Lama Zopa Rinpoche recommends listening to this sutra to help alleviate pain. We’re very happy to announce that Tom Truty is now FPMT Education Services Director (formerly, FPMT Education Services Coordinator). Tremendous and heartfelt thanks to all who participated in offering towards His Holiness the Dalai Lama’s teachings on the Eighteen Great Lam-rim Commentaries. We are delighted to report that as a result of the kindness of many, we have been able to raise US$350,000! Due to a request to raise additional funds in order to offer more support to this event, FPMT has committed to raise US$425,000; an additional US$75,000. For more details about this event, please visit Preserving the Lineage Fund’s Latest News. To learn more about this event, including how to register, please visit the event’s official site. 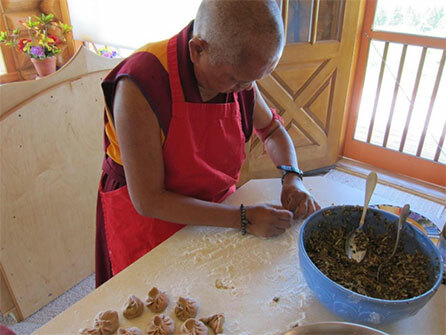 Lama Zopa Rinpoche cooking momos (dumplings), Washington, United States, July 2012. Khadro-la at Maitripa College, Portland, Oregon, United States, June 2012. Mandala magazine is putting the finishing touches on its next issue, which features a new interview with Khadro-la. Other stories include a profile of Geshe Kelsang Wangmo, the first female geshe; an excerpt from the just released book How to Practice Dharma: Teachings on the Eight Worldly Dharmas by Lama Zopa Rinpoche; and news of events and activities important to the international FPMT community. If you are not already receiving Mandala but would like to, please consider becoming a Friend of FPMT. Sign up by August 26 to receive the next issue. LRZTP 6 will officially start in two months’ time! So far, 18 students have registered for the course, with 14 of them committed to train as FPMT interpreters, and three as freelancers. With an extremely motivated and enthusiastic group of students from many diverse cultures and languages (UK, USA, Israel, Singapore, Russia, Chile, the Netherlands and Australia), LRZTP 6 promises to provide a rich resource of interpreters for FPMT centers. Contact director Claire Yeshe Barde for more information and to connect your center with a trainee interpreter now. Give your center’s community a taste of the Dharma! Get a 55% discount on the Discovering Buddhism Series on DVD. This DVD set is designed to be viewed on its own or used as supplementary material for anyone following the Discovering Buddhism program. Each of the thirteen 30-minute segments is introduced by Richard Gere or Keanu Reeves. DVD set is available subtitled in English, French, Spanish or German. Lama Yeshe Wisdom Archive has just published How to Practice Dharma: Teachings on the Eight Worldly Dharmas, the second in its FPMT Lineage Series, a series of lam-rim commentaries by Lama Zopa Rinpoche drawn from his four decades of teaching on the path to enlightenment. It is available on Kindle (other e-reader versions are coming) as well as in print. In this 250-page book, Rinpoche explains in great detail how attachment to the happiness and comfort of this life is the cause of suffering and how abandoning attachment is the source of all happiness. It’s only US$10, with a 50% discount for FPMT center bookstores. The first in the series was Heart of the Path. Next up will be books on the perfect human rebirth, and impermanence and death. At the mani retreat hosted by Rinchen Jangsem Ling, Malaysia during Saka Dawa, retreatants completed 24,840,528 mani mantras and dedicated the merit accumulated for the long life of His Holiness the Dalai Lama and Lama Zopa Rinpoche and for the success of all the FPMT centers, projects and services around the world. 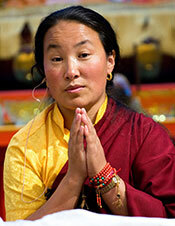 Vajrapani Institute Needs to Hear from You! Vajrapani Institute is currently exploring interest for an online program to support the meditation practice of students between retreats, teachings, or whenever motivation wanes. In order to best meet this need, they want to hear from you. Please share your thoughts through this 10-minute survey. When you complete this survey, you are automatically entered to win an US$80 gift voucher to The FPMT Foundation Store. The winner will be chosen on September 15 and announced on Vajrapani’s Facebook page. Please check out these exciting opportunities to offer service in FPMT centers, projects and services around the world!